MILTON KEYNES – ABOUT TO LOSE A LANDMARK AND GAIN A CLONE? March, 2014. By architectural standards it’s a flimsy piece of work, but The Point in Central Milton Keynes captured people’s imagination. It was the first purpose-built multi-screen cinema in the country, and in an era of massive cinema closures The Point introduced American cinema-going to the British public and halted its decline. In this, it captured the spirit of a pioneering New Town. Love it or hate it – the Point may have had its day. Now, however, The Point’s owners, Hammerson, are keen to demolish the well-known ziggurat and redevelop most (but not all) of the site. On Thursday, 6 March, its fate will be decided by MK Council. If Hammerson had come up with an outstanding new ‘Point’ there might have been less resistance to losing the original. But they have not. Instead, they have offered a sop to nostalgia and the sketchiest of outline planning applications. An explosion in a triangle factory – could the new Point look like this? Or like Melbourne’s dreary Federation Square, below. People are asking how MK Council can decide the fate of this important building, on a prime site, with so little to go on. Neighbouring businesses, CMK Town Council and Xplain are among many who are not impressed. Quoting dozens of planning policies, Xplain has made a case for refusing permission and holding out for a full planning application. To us, the application shows a lack of interest in delivering anything that would add vibrancy to the city centre and public realm. Where, for example, is there any provision for permeability, colonnades, courtyards, greenery, artworks and other features that would help knit this development into the boulevards of CMK? How will the development enhance the setting of the Grade ll listed Shopping Building, the most important symbol of MK and of national importance? Why cherry pick only part of the site for redevelopment when the old multi-storey car park could also be demolished and wrapped into a more interesting, multi-faceted new development? To their credit, Hammerson has tried to respond to general criticism of their first design, and also adopted an early proposal from Xplain to add a public roof terrace. This would offer rare views across the city and possibly space for live music. But there is no guarantee that this, or any other public realm improvement, will be built, as this is an outline application. If approved, the expanded footprint and height of the new building would be agreed, along with the principle of redevelopment. It may not sound much, but from a commercial point of view this is highly desirable. The danger is that MK will end up with a large, garish shed, more appropriate for an out of town Retail Park than a true city centre. And MK will have lost a landmark, and gained a clone. At its best Deconstructivism delivered the Guggenheim in Bilbao. At its worst, Melbourne’s Federation Square, below, voted one of the five ugliest buildings in the world. Photo: Looks familiar? 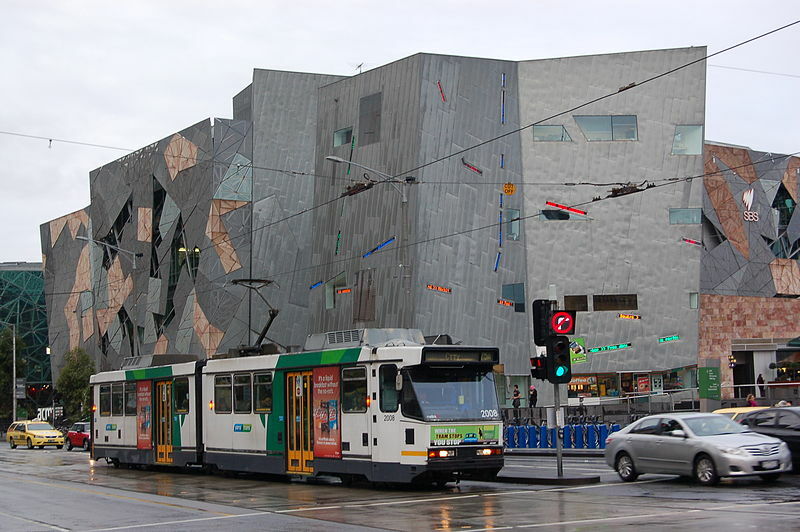 Part of Melbourne’s Federation Square project, 1997 – 2002, voted one of the five ugliest buildings in the world. Photo by Bahnfrend. MK Council is custodian of a city centre with tremendous promise. Report after report names MK as the place to watch. Xplain believes there is no need to give away such a prime opportunity on the strength of such sketchy plans. 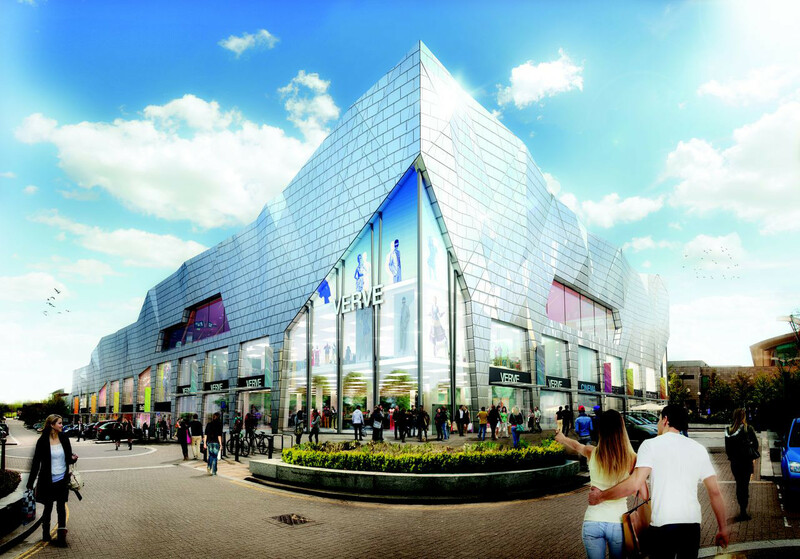 Although planning officers are recommending approval of Hammerson’s plans for The Point, they also want some vital conditions attached, including a Design Code. Watch for the update after tomorrow’s decision. This entry was posted in 20th C architecture under threat, CMK, Destruction of CMK, General, Milton Keynes, protecting CMK, The Point on March 5, 2014 by xplain. Well done xplainmk for standing-up for the continuity of the design integrity of Milton Keynes and CMK. I am convinced that the Point has had it’s day. It is an eyesore and I do agree with those who have observed that the building has had so many refits that it is simply not capable of standing the test of time, sad as that may be. It also annoys me when people talk about the Point being the first multiplex cinema in the UK. As far as I’m aware the cinema is in a building adjoining the Point. The actual iconic red and glass building, known as the Point, has never housed a cinema – has it? Hammerson’s outline designs are far from perfect, but in my view they represent a huge improvement to the current state of the Point. CMK needs more shopping space and the demolition of the Point will provide it. I do warm to Hammerson’s design, and I will encourage the Council to approve, but I’m also hoping (with fingers and toes crossed) that the designers deliver, to CMK, another iconic and memorable building. Please keep the pressure on the developers / designers, xplainmk. But I’d also encourage you to support the general redevelopment of the Point in order to rid CMK of this current eyesore.